Whether you are an adult looking for an exciting hobby or you want to share the wonder and excitement of kite flying with your kids, our huge rainbow kite is perfect for you. 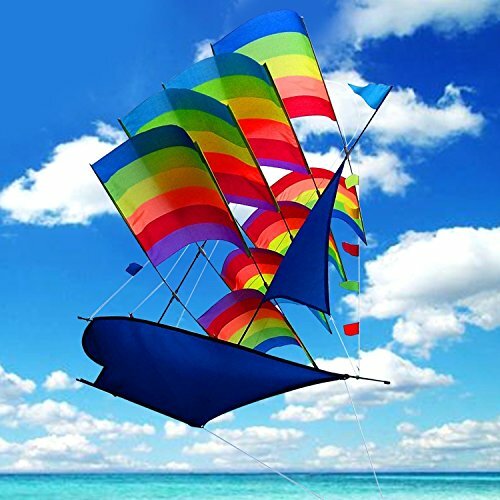 Large size,which could be 31.9 x 29.9 x 35.8 inch when installed.this big kite with bright rainbow colors flies easily and looks spectacular against the blue sky. This versatile kite is ideal for learning the basics of kite flying. Kids will build their strength and coordination as they launch and recover it. They'll also improve critical thinking skills as they learn to fly it in different types of winds and environments. Beautiful with bright rainbow colors,Flying the kite is undoubtedly an entertaining activity for both kids and adults. Use it any open area, from beaches to parks, and enjoy spending quality time with your family. Awesome Kites Designs: Our Tresbro unique rainbow kites used the best kite making supplies, high quality ripstop polyester fabric with strong rods as the central support, making the kite lightweight and durable so it can fly fabulously even with minimal wind. Performs best in winds ranging from 5-16 mph. Valuable Family Time: Our huge kites are perfect addition to your set of outdoor games and beach toys for kids.Flying kites is a good chance to build family memories on the beach, park and playground outdoor activity time. Easy to Assemble: The sailboat kite is specially designed for simple assembly and for boys and girls. The package comes with all the kite parts including kite string and simple clear instruction, After setting up in less minutes, it's a really large wonderful kite. Extremely Easy to Fly: Flying this huge kite particularly in light winds can require some degree of skill. This easy flyer is specially designed to be stable and not difficult to launch in any level of wind. you can take it for your family vacation. It is fun for all the ages and it does not matter whether you are beginner or an expert in kite flying. Full Money Guarantee: We provide 100% no-asking return or replacement guarantee if you are not satisfied with the ship kite. If you have any questions about this product by Tresbro, contact us by completing and submitting the form below. If you are looking for a specif part number, please include it with your message.